Here's my card for the Less is More Challenge week 114 where the colour theme is LIME and BLACK. I had the pleasure of visiting The Craft Barn in it's new premises on Saturday and I spotted some Cosmic Shimmer Golden Lime Embossing Powder so I thought it would be rude not to use it for this challenge. 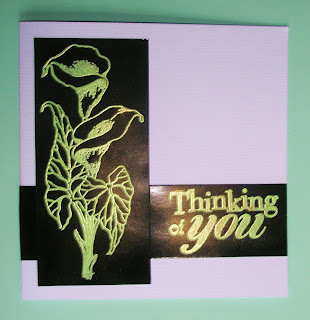 The Calla Lily stamp is an Elusive Images/Chocolate Baroque stamp and the sentiment is from Hero Arts - I embossed both onto black gloss card to make the lime powder pop. The pearlescence in the powder also left a golden sheen on the card - it looks lovely in real life but was very difficult to photo. I apologise.....my own fault for using a two-tone powder and gloss card.....maybe I should have added some mirri card as well to make it even more difficult!! Anyway I hope you like my card. Thanks for looking and for your comments - they are as ever much appreciated! Stunning effect with the lime embossing on the black. Elaine, the card is very striking...the color really pops, love those lily's!! Thank you for your kind comment on my blog, you know how much we appreciate those words! Your embossing looks tremendous Elaine... perfect colour too!